A brass deer and dishes. Oh yes, and a basket. It’s what I collected as thrift finds in the past couple weeks. 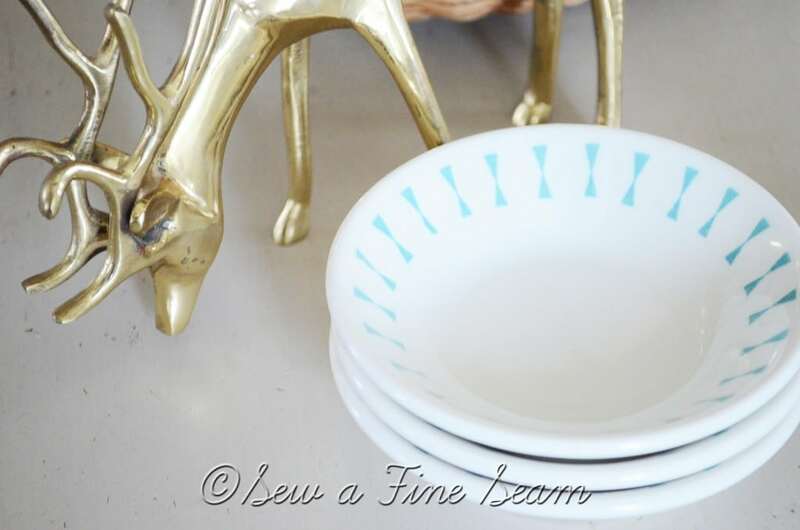 I have a small pile of thrifted dishes now. Some of them are probably going to have to go in the ‘for sale’ pile but I’m having a hard time deciding which ones. I have the same problem with all the chairs I find myself ending up with. These cute little dishes got used today – my husband warmed sauce for bread sticks in them and we each had our own little bowl. There are actually 4 of these but one was being used already by the time I took the pics. There are 4 of these also. I may have to keep these at least for a while. They are white. They are just the right size. My kids are always wanting little ‘cups’ for yogurt or dip or ketchup – they even use them to drink milk sometimes. The basket is kind of cute. It was super cheap. 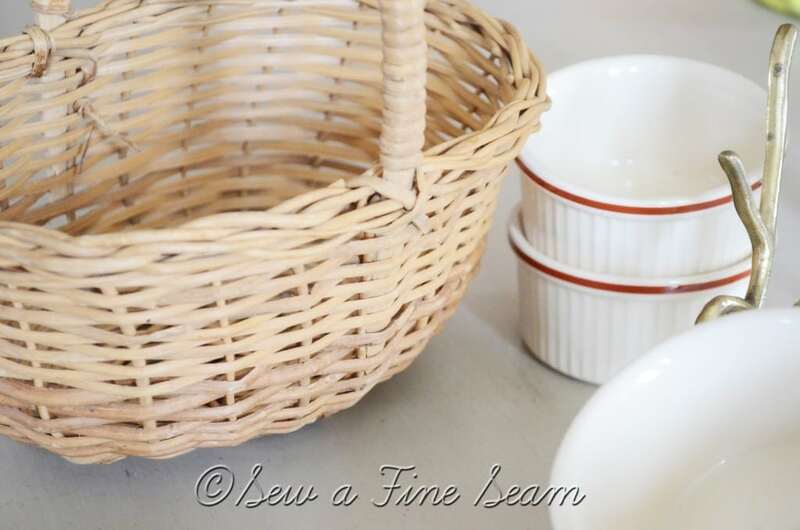 It was a great way to carry around the little dishes as I searched through clothes with my nine-year old. She found a faux leather jacket. She begged and begged. It was $8.99 – BUT the ticket was green and green was half off that day. She got the faux leather coat. I’m sure you noticed this little guy peeking his head into the other photos! He cost more than I like to pay at a thrift store. Goodwill seems to be figuring out what is ‘in’ and ‘cool’. His price tag was $4.99. But I grabbed him up immediately, and even though I did debate a bit over the price I never put him back on the shelf. I saw some of these at Christmastime with price tags around $40 and $50. And I knew that if I left him there I would long regret it. My first thought was to use some white chalk paint on him but now I’m leaning towards some silver rub and buff. I used copper and then silver rub and buff on the vase I put my faux peonies in – you can see it here. I love how the stuff works and think I’m going to see what it will do for this little guy. Even though I’ve picked up a few little things here and there I am ready to go for an all-day thrift trip. Anyone local want to go? 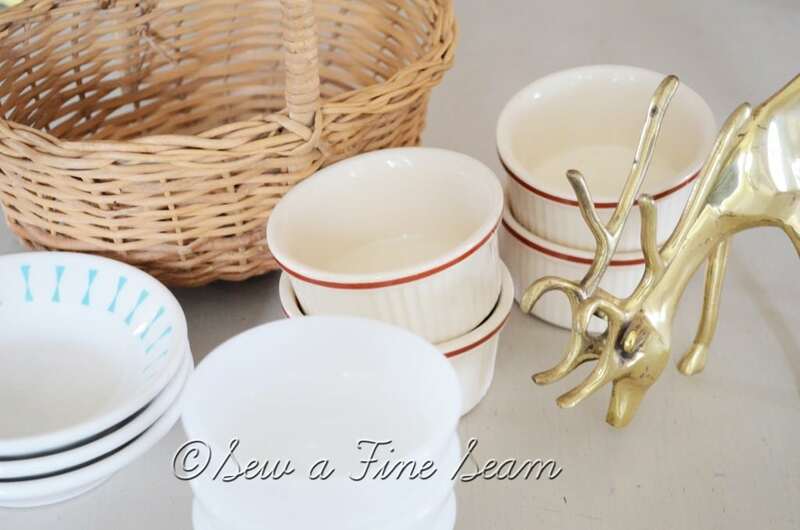 Have you found any fun thrift finds lately? I’d love to hear about them! Would you like to get my updates in your inbox? Sign up here! Fun finds! 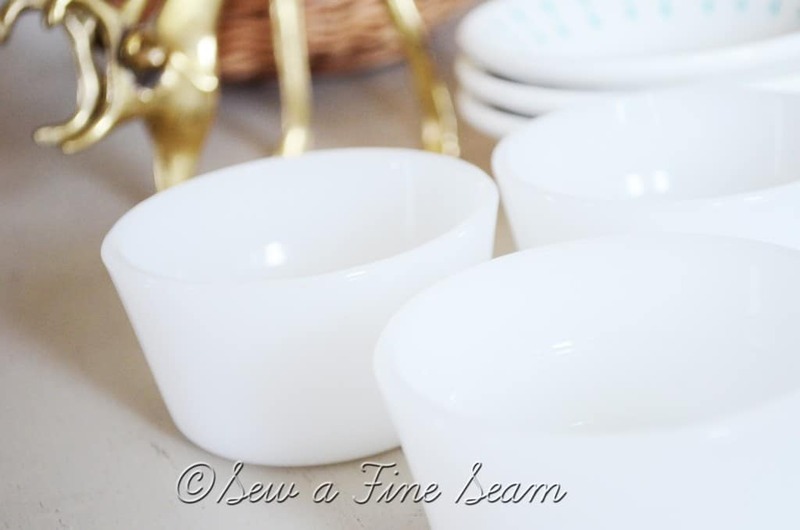 It seems like there are always uses for little bowls and we never have enough. I like the sounds of the size of the white ones. The deer very much goes with your decor. You would definitely have regretted leaving him. And hooray for half-price tags! I like having little collections of things. It’s a fine line though between a collection and a problem with hoarding! You got that right pam! I should blog a pic of my living room right now! I have some chairs for a client here to be slip covered and they are in my living room. Along with a deconstructed chair waiting to be reupholstered. And 3 of our own chairs that are mismatches and need to be sold or upcycled or something! It’s a sight. Must get it under control soon! I wanna go thrifting!!!!! like, really badly! Miss Belle, I will let you know next time I am going for a day and see if you wanna go along! I would love to go thrifting with you! (Of course someone could end up getting hurt-ha! 🙂 Love your little deer-I have one similar! LOL! I’m usually the one hanging back and taking my time wondering if it’s really cool or if it’s junk. But if you were with me I might be elbowing my way through and grabbing everything in sight – just in case!!!! Kellie that would be so fun! It’s been awhile since I’ve been to the Dayton thrifts. We should meet up – what day/week works best for you??! 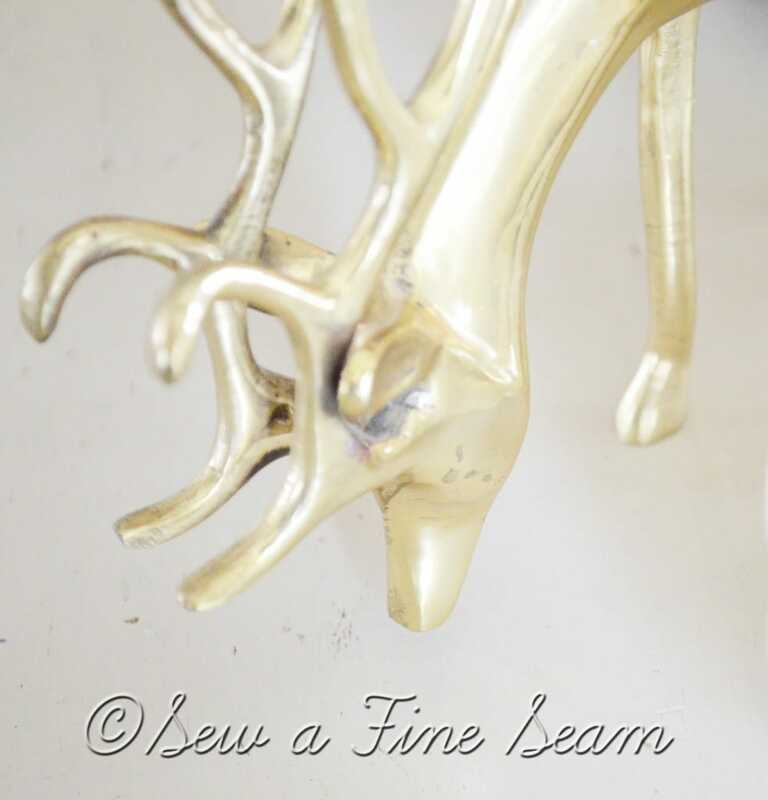 Great finds…love the deer! I can’t wait to see how you dress him up! Thanks Cindy! He will be fun to have for fall decor – something to look forward to when summer is waning and I’m sad about that! And that little deer is very photogenic. Makes a nice addition sticking his head into your other shots as well. Good thing you snagged him. The bowls are practical. You can always use more bowls, right? I found a selection of metal items at Goodwill this week. It’s always fun to see what’s out there. It must be a ‘deer’ thing! My wall hanging deer likes to be photographed too 🙂 I like to pop into goodwill and salvation army any time I’m going by – you just never know what treasure you may find! Oh yeah Diana – someday I’m sure I will end up on Hoarders! LOL! I just want to share if there are any readers from the Kansas City area. Every Sunday the DAV has everything that has already been marked down 3 times (marked by a certain tag color) is .25. Yes, one quarter. I have bought a hutch, chairs, recliner, lamps, dishes, clothes….you name it. My girlfriend got her granddaughter a wedding dress for .25. On line the same dress was being sold for $400.00. I have asked if all DAV’s do this and store employees don’t know. Other people I’ve talked to say they don’t. I gotta tell you, it is too too much fun. If you come to Kansas City, drive a truck. That sounds like a dream! How wonderful! We travel to Kansas every year – we go south at Kansas City – maybe next time I will have to bring a truck and stop for some shopping! I wish I could go thrifting with you. I really do! I adore your little deer. That would be so fun Amy! Maybe one day it will work out! 🙂 Pizza sauce is most often what we use little cups for 🙂 I bet you make a wonderful pizza and breadsticks! I agree – I think Good Will has a style expert working there figuring out what’s hot so they can jack up the prices! 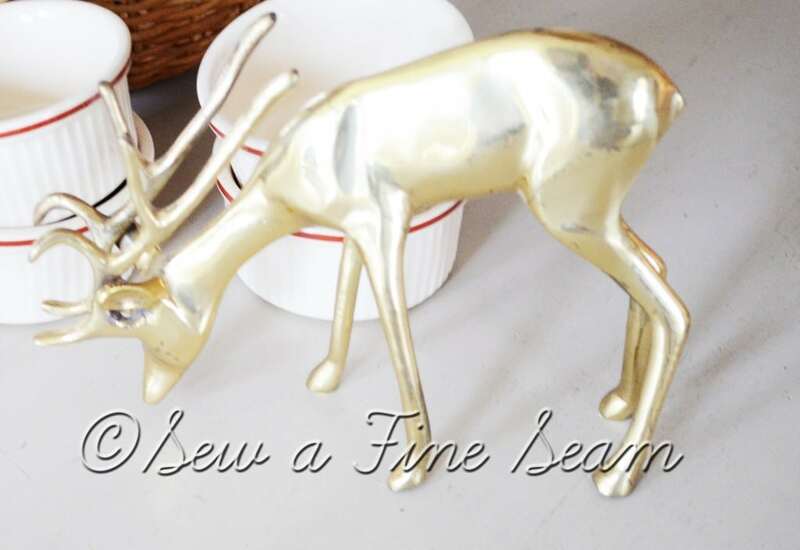 Great finds – love the deer! Thanks Kelly! Maybe I should get a job at Goodwill and keep the prices down for all of us – heehee!